On 8 December 2010, 21 year old Antonio Martinez [aka Muhammad Hussain], a recent convert to radical Islam, was arrested after he attempted to blow up a military recruiting center in Catonsville, Maryland, using what he believed was a vehicle borne improvised explosive device [VBIED]. According to the criminal complaint, Martinez came to the attention of the FBI after a confidential source informed them of the following statement he had made on his Facebook page, “Any 1 who ALLAH and HIS Prophet PEACE .Be.Upon. Him I hate u with all of my heart”. 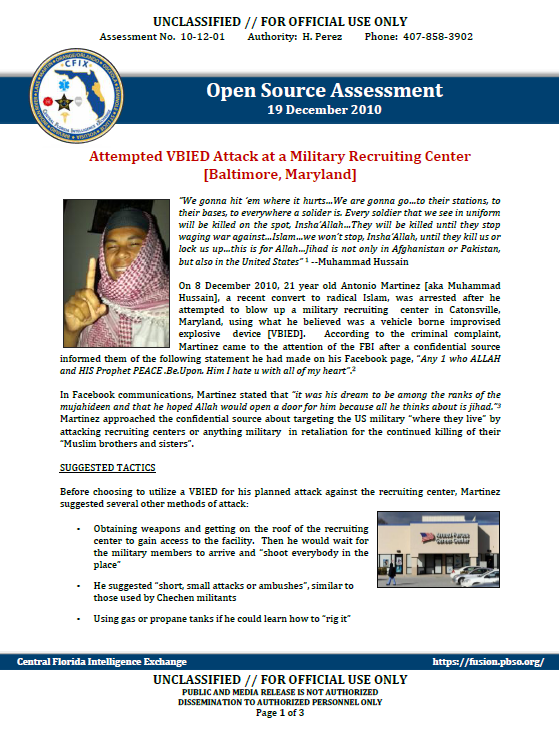 In Facebook communications, Martinez stated that “it was his dream to be among the ranks of the mujahideen and that he hoped Allah would open a door for him because all he thinks about is jihad.” Martinez approached the confidential source about targeting the US military “where they live” by attacking recruiting centers or anything military in retaliation for the continued killing of their “Muslim brothers and sisters”. Having knowledge about Islam is no longer necessary to become an activist for the cause. Many are now becoming radicalized simply from reading and listening to militant propaganda shown on the news, internent and Islamic forums, which allows for a much shorter time period between radicalization and participation in an attack, as seen with Martinez’s arrest. Martinez’s criminal complaint indicates that he had accounts on popular social networking sites such as YouTube and Facebook, both of which have been used by other subjects arrested on similar charges over the last couple of years. • Yemeni-American, Anwar Awlaki, is an inspirational cleric and leading English language al Qaeda internet recruiter and propagandist who advocates for American Muslims to commit Jihad against the U.S. and other western countries. Anwar al-Awlaki has become a religious icon who has inspired others, particularly in the West, to pursue violent jihad. Over the last several years, Awlaki has transformed his role from spiritual leader and mentor to active recruiter and advocate for Al-Qa’ida in Yemen. • Omar Bakri Muhammad, a Syrian born cleric who helped develop radical organizations Hizb ut-Tahrir and al-Muhajiroun. His lectures are widely available on the internet and during 2010 live lectures were available on the ‘Authentic Tawheed’ website, along with live lectures from other radical clerics such Abdullah Faisal and Anjem Choudary.